Kornati islands, also called Stomorski islands are located in northern part of Dalmatia, west of the city of Šibenik and east of the city of Zadar. Kornati islands occupy a sea area of around 320 square kilometers and are divided into two main groups – Upper and Lower Kornati. There are no permanent settlements on the islands, Kornati archipelago has roughly 140 islands and 89 of them make part of the Kornati Islands National Park, declared in 1980. The area covered by the National Park principally coincides with the Upper Kornati, which include the biggest island of the archipelago Kornat and the surrounding islets. It is a perfect place for numerous activities like sailing, snorkeling, diving, swimming, hiking, observing the plant and animal wildlife and those in search of a real sense of escape and remoteness. The Kornati National Park contains some of the most beautiful and inspiring landscapes in Croatia, marked by barren, irregular karst terrain, on the southwestern side feature spectacular cliffs, rising more than 80 meters above the sea level. Underwater landscape of Kornati islands is absolutely fascinating, making this spectacular piece of paradise a perfect destination for divers. Other than enjoying the fantastic maritime landscapes, beautiful beaches, and crystal clear sea, there are several interesting historical sites worth visiting. The evidence that Kornati islands were inhabited in Neolithic period is a stone axe found on the island of Kornat and it can be seen in the Archaeological Museum in Zadar. You can also visit the remains of Illyrian settlements and Roman ruins on Toreta Hill and the remains of an early Christian three-nave basilica. The ruin of a Byzantine fortress, Tureta at the Kornat island is the most impressive building found on Kornati islands. Several other ruins of medieval fortifications can be found on the islands. Kornati islands can be reached by organized tours or by your own boat. Anchoring and spending the night in the Park is allowed only at 16 locations and camping is rigorously forbidden outside the authorized campsites. If you want to relax in a hidden oasis far from the urban rush, get up close and personal with nature, then renting a small stone house on one of the islands is a perfect choice for you. There are also several restaurants and boats that cruise around the national park selling food and basic supplies during the high season. The park is managed by the town of Murter, on the island of Murter. UNESCO established its lists of Intangible Cultural Heritage with the aim of protecting valuable intangible heritages around the world. Croatia is the country with the largest number of protected cultural phenomena in Europe with 14 Intangible Cultural Heritages added to the UNESCO list. Only Japan, China, and Korea have more registered phenomena. Sinjska Alka is medieval equestrian competition, held in the town of Sinj every first Sunday in August since 1717 and it honors the Croatian-Venetian victory during the Ottoman invasion. Sinjska Alka was inscribed in the UNESCO Intangible Cultural Heritage List in 2010. This particular event consists of a competition in which several horsemen ride at full gallop aiming their lances at an iron ring called Alka, suspended a few meters above the ground and are awarded points depending on which part of the ring they are able to pierce. Participating in the competition is considered of a great privilege and only men born in Sinj municipality can take part in Sinjska Alka. More than thousand years old, the tradition of the Festival of St. Blaise began in 972 after the saint appeared to a priest urging him to tell to Dubrovnik Senate that the Venetians are about to attack them. After the citizens of Dubrovnik managed to stop the Venetians from conquering the town, they declared St Blaise as Dubrovnik’s main patron. St Blaise is celebrated yearly on 3 February, when relics of the saint, his head, a bit of bone from his throat, his right hand and his left, are paraded in reliquaries, but the Festivity starts on the day of Our Lady of Candelora, celebrated on February 2, with the releasing of white doves, which symbolize freedom and peace, in front of Dubrovnik Cathedral. This stunning festivity was inscribed in the UNESCO Intangible Cultural Heritage List in 2009. The most famous procession participants of the Rijeka Carnival magic are the bell ringers. Following the centuries old route, they walk from village to village, making a lot of noise in order to scare away evil spirits of winter and welcome the spring. Besides the Halubje bell ringers (Marčelji and Viškovo), there are quite a lot of more groups from Brgud, Bregi, Mučići, Rukavac, Mune, Zamet, and Žejane. The bell ringers from the west have numerous smaller bells around their waist, their faces are able to be seen and they also wear a hat with greenery and colorful paper flowers (krabujosnica), whereas on the other hand, from the east wear big masks and a single large bell. It was added to UNESCO’s Representative List of the Intangible Cultural Heritage of Humanity in 2009. Ojkanje singing is a tradition of folk singing in Dalmatian hinterland and some parts of Central Croatia. The Harvard Dictionary of Music (2003) describes this singing style as: “The ojkanje is a peculiar style of singing melisma with a sharp and prolonged shaking of the voice on the syllables oj or hoj.” This singing style is marked by a distinctive voice-shaking technique where the singers utilize an archaic form of singing from the throat. Ojkanje singing was inscribed in the UNESCO Intangible Cultural Heritage List in 2010. Lacemaking was added to the UNESCO’s Representative List of the Intangible Cultural Heritage of Humanity in 2009, represented by the Pag, Hvar and Lepoglava lace. Lacemaking dates back to the Renaissance and the Croatian lace has become renowned for its unique designs and patterns. For example, the particularity of the Hvar lace is that the thread is collected from the aloe leaves of agave plants that grow on the island. In the town of Pag, there is a small lace gallery and in Lepoglava you can visit the Eco-museum of Lace and Lacemaking where you can admire a part of Croatian culture, some unique examples of lacework, attend workshops and classes and much more. To celebrate this particular cultural heritage, every year in September international lace festival is held in Lepoglava. Nijemo Kolo is a silent dance originating from the Dalmatian hinterland in southern Croatia, included on the UNESCO Intangible Cultural Heritage list back in 2011. It is a dance performed by forming a closed circle, with the men leading their female partners in quick, vigorous and improvised steps. But maybe the most interesting thing about this dance is that it is performed completely without any music. Today, the performances of this particular dance can be seen during the festivals and various celebrations. The many centuries old traditional procession Za Križen (Following the Cross) on the island of Hvar happens on the night from Maundy Thursday till Good Friday when thousands of guests and local worshippers walk 27 kilometers following the cross. Convoys from all six parishes from Hvar leave in the evening, and they do not pass each other when they are on their way. The procession is led by a cross-bearer who is accompanied by two assistants; large candlesticks are carried by two followers, two lead singers and many people who react by singing the Lamentations of the Virgin Mary. All members of this convoy wear white brotherhood tunics. The priest then blesses the cross at the parish church and ropes it while the singers sing the Lamentations of the Virgin Mary and the walk then continues. There are many available records which write about the cross bleeding which happened on 6 February 1510 in the house of Nikola Bevilaqua when the riots between the masses and the noblemen were taking place. Two-part singing and playing in the Istrian Scale is a complex style of folk music genres which use the scale. The custom of narrow breaks in music in Istria and the Croatian Littoral has been the center of much interest for Croatian researchers throughout the entire 20th century. In the 1920s Ivan Matetić Ronjgov established the term Istrian scale, disagreeing between its four basic types, but in the 80s, certain researchers initiated the term narrow intervals since it describes the complex relations between the tones in this tradition. The annual spring procession of Ljelje/Kraljice (Queens) from Gorjani near Đakovo is held on Whit Sunday and is characterized by colorful folk costumes with lavishly decorated high hats and Sabers. It is performed by young girls, who sing from house to house in procession. In 2009, UNESCO inscribed the spring procession on the List of the Intangible Cultural Heritage of Humanity. Bećarac is humorous folk singing, very popular and an integrated part of cultures of Slavonia, Srijem, and Baranja. Becarac singing is often performed on various merry occasions, especially on wedding celebrations. It is usually performed by three or more singers accompanied by instruments. One singer usually sings the first verse which presents a kind of meaningful thesis, and then the second verse is sung by all singers in a humorous way that leaves lots of space for improvisation. Singers often express thoughts and feelings about love, village life, and relationships in a funny way, that on other occasions would be considered inappropriate. In 2011, UNESCO inscribed Bećarac singing on the List of the Intangible Cultural Heritage of Humanity. Klapa is traditional Dalmatian a cappella singing group. Klapa is usually composed of several singers, a first tenor, a second tenor, a baritone, and a bass. There are also female klapa groups that gained popularity in the recent times. The most important event dedicated to this form of singing is Omiš Festival of Dalmatian Klapa and it is usually held on the weekends from the end of June until the end of July. In 2012, UNESCO inscribed the klapa singing on the List of the Intangible Cultural Heritage of Humanity. Croatia through the years has become a very popular tourist destination, as it has a rich cultural and historical heritage, stunning landscapes and amazing places to spend a beach holiday. Croatia has more than 1200 islands and islets, but not only, its Adriatic Sea mainland coast is 1,777 kilometers long and it hides numerous amazing beaches, bays, and caves. Its stunning beaches always find their place on the lists of best beaches in the world in many prestigious international magazines, as Zlatni rat beach, which became a trademark of Croatian tourism. Unlike many seaside destinations around the world, Croatia has a limited number of sand beaches, as most of them are made of small, gray and white pebbles. Every major island has well-organized beaches, with umbrellas, beach lounge chairs, showers, water sports rentals, sea rescue service ect., but also numerous hidden and isolated beaches which offer ample tranquility for those in search of total relaxation. Today, we bring you a list of some of the most beautiful beaches in Dalmatia, let us know if you have already visited any of these stunning beaches. This stunning 500 meters long beach is situated on the southern coast of the Island of Brac just 2 km from a beautiful town of Bol. Its elegance and allure have made it the symbol of both the island and coastal Croatia. It has a unique shape, like a tongue that stretches into the sea and changes its shape and position, depending on the wind, tide and the current. It is protected by the government of Croatia as a geomorphological monument. Zlatni Rat beach has a Blue Flag, which guarantees the highest quality of water, facilities, safety, environmental education and management. Stiniva beach is located in the southern part of the island of Vis. It is a beautiful hidden beach on the southern part of the island. Surrounded by high cliffs, one part of this fantastic pebble beach is always in the shade, so you can also hide from the hot midday sun, as umbrellas and beach chairs are not available for rent on the beach. This breathtaking bay can be reached by boat or on foot and the wild landscape with clean turquoise sea will give you some unforgettable moments. Sakarun beach is located on the northwest side of Dugi Otok. It is best known for its white sand that is not very common in Croatia, where the beaches are usually completely pebbly. The beach is located in a bay, facing south and it is around 800 meters long. 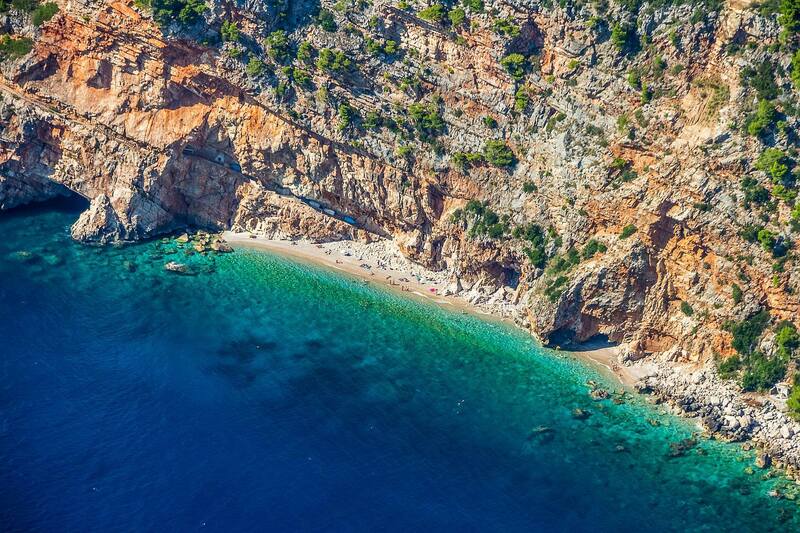 This beach is one of the most beautiful beaches in Croatia, but also one of the best-kept secrets. The water is calm and shallow, so that makes it a perfect place for families with children. On the beach, there are two facilities that offer food and drink, but besides that the entire western coast of the island is not settled, giving you the experience of pristine coastline unspoiled by man. Pelješac peninsula has a 200 km long coastline, home to numerous beaches and coves, where to enjoy an environment of total calm and tranquillity. On Pelješac peninsula you can find pebble and sand beaches, nudist beaches, well-equipped or completely hidden ones surrounded only by unspoiled nature. Popratno beach is situated in the homonymous bay, famous for its shallow and warm water, which makes it ideal for families with children. The beach is around 300 meters long, surrounded by a rocky coast, but there are also pine trees which provide natural shadow, the perfect hideout from the hot midday sun. Pasjača beach is located near the town of Konavli in the southernmost part of Croatia. The beach Pasjača is approachable only by long and very steep stairs carved into the rocks. The stairs bridge the altitude difference of more than 100 meters. One of the best things about this beach is the fact it is rarely crowded because it is difficult for boat and yacht to anchor in the area and the beach is not easily accessible. Crystal clear sea, small white pebbles, and the rugged coastline make this isolated strip of land the perfect place to get away from the city stress and all the crowded places. Divna beach is another spectacular beach situated on the northern part of the Pelješac peninsula. This stunning 200 meters long beach is located in the homonymous small bay and it offers a spectacular coastal scenery. There are no facilities on the beach, just a campsite that offers some basic facilities. The particularity in which you can enjoy when in Divna bay is a small inhabited island in front of the beach that you can swim to. With a somewhat Robinson appearance, the bay is perfect for those in search of a unique relaxing experience surrounded by unspoiled nature. Saplunara beach is a sandy beach located on the southeastern point of the island. Due to the existence of many endemic plants, this kilometer long bay and its surroundings were proclaimed a protected area. Saplunara actually consists of two main beaches, Vela (Big) and Mala (Small) Salpunara, both surrounded by a forest of Aleppo pines. The water is shallow and warm, so it is a perfect beach for families with children. Nearby there is another stunning sandy beach in the Blace bay, that seems more like a shallow blue lagoon. An interesting fact about Saplunara beach is that Luke the Evangelist wrote about St Paul the apostle, spending three months preaching on the island after he shipwrecked in 61 AD after traveling from Palestine. Primošten has beautiful long, pebble beaches, located right in the center of the town, bathed by a crystal clear sea and almost entirely surrounded by lovely pine trees, that make a perfect hideout from the midday sun. One of the most beautiful beaches is Raduča beach, located in Vela Raduča bay and it stretches along the entire length of the homonymous peninsula. 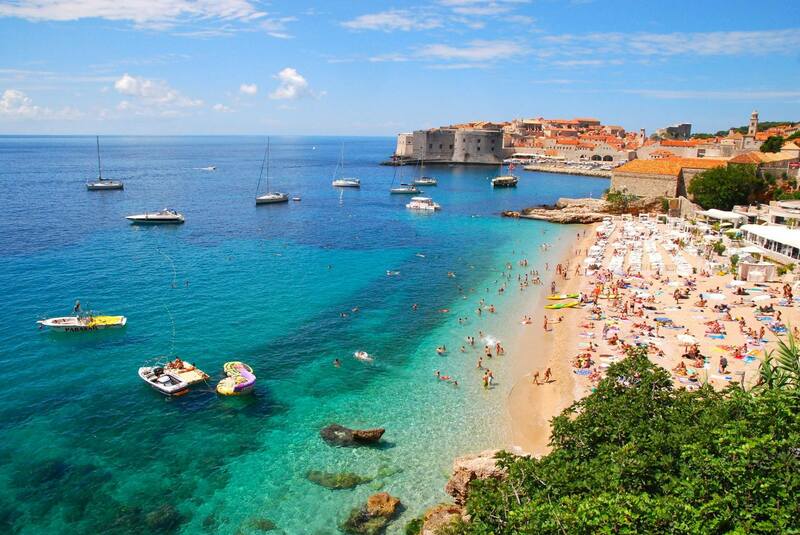 The beach can often be found on the list of the best beaches in Croatia. Another beautiful beach is Mala Raduča (Small Raduča), that lies in Mala Raduča bay, located practically in the center of the town. Brela is a famous tourist resort situated on Makarska Riviera, home to some of the most beautiful beaches in Croatia. Podrače beach is a small pebbly beach surrounded by charming pine and tamarisk trees. The sea is crystal clear and it is a perfect place for snorkeling and exploring the rich underwater life. The beach is quite small so it is usually crowded during the hot summer days, but because of its beauty, if you plan on visiting Makarska Riviera absolutely add it on your must-visit list. At 300 meters from the Old town, Banje beach is the closest place to take a swim and still be in the very center of Dubrovnik. Fabulous views of the City walls give you a different experience from most beaches that usually face the open sea or islands. Clearwater is the norm in Croatia, so Banje beach is no different. There is a possibility to rent a pedal boat and take a ride along the city walls or to the small island of Lokrum, that is located nearby, but you can also take a parachute ride for a much more fascinating experience that offers you an incredible view of the historic center of Dubrovnik. The island of Pag makes part of the north-Dalmatian archipelago and it is the fifth largest island in Croatia. Two main towns on the island are Pag and Novalja and there are several small villages. Due to strong winds mostly during the winter, a large part of the island is rocky with small areas covered with Mediterranean vegetation. Nowadays, Pag is mostly known as one of the best Croatian’s party destinations, thanks to the resort of Novalja, which is located in the north of the island and hosts many summer music festivals and a considerable number of open-air clubs. However, if you are not that much in hard-core partying, don’t avoid the island as there’s much more to do and see there as well! Connected with the bridge to the mainland, the island is easily reachable, but all the same very independent culturally. The locals produce excellent wine, cheese, milk and lace which can be seen on the kitchen walls all around Croatia. Its natural landscapes will take your breath away and the old monuments that can be found all around the island will allow you to dig deeper into its history. For a long long time, the town of Pag has been surrounded by the thick stone walls which purpose was to defend the inhabitants and nearby salt pans. The town was founded in 1443 and it was planned symmetrically with the main square and a net of parallel streets. In the northern part of the town center, you can see the remains of City Walls and the tower Skrivanat. Duke’s Palace (Knezev Dvor) is situated in the main square and decorated with the beautiful fountain and two tall palm-trees. Built in the 15th century, it served as the residence of the Venetian Duke. The Church of St George was built around the same time as the Palace and was a part of the defensive wall of the city. Thanks to its geographical position, the island of Pag is cut by the 15th Meridian which is marked with the marble monument situated around 5km from the town of Pag. Relatively recently, the new bridge Katine was built to replace the old one from the 15th century and it connects the old city of Pag with the storage of salts which have always had an important role in the lives of the locals. The Pag’s salt production belongs to the oldest of the east Adriatic coast lasting for around thousands of years. You can visit the salterns to find out more about the process of producing salt. To take amazing photos or to simply enjoy some beautiful panoramic view, visit the lookout Gradec, placed on the road that connects Novalja and Pag. You can also visit two karst lakes, Velo Blato and Malo Blato. On the island, you can find numerous beautiful beaches as only the bay of Pag is surrounded by more than 25 km of stunning sandy beaches, but there are many other stunning beaches on the island. One of the most famous is Zrće beach, well-equipped and a true paradise for party lovers. Sv Duh beach or Prosika beach are perfect for families with children as the water is calm and shallow and are also well-equipped. Other than tasting traditional Dalmatian dishes like seafood specialties like octopus under the lid, black squid risotto or grilled fish with seasoned vegetables, we absolutely recommend you to try the famous Pag lamb. Together with Brač lamb, it is considered to be the best lamb meat one can eat in Croatia and the wider region. The unique flavor and texture of this lamb meat are given by the sheep’s sea salt wild herbs and grass diet. Another special local produce not to miss is Paški sir, tasty cheese made of sheep milk, rubbed in olive oil while maturing accompanied with a glass of famous Pag wine Žutica. There is a really special souvenir one can take home from the island of Pag and it is the famous Pag lace. Lacemaking was added to the UNESCO’s Representative List of the Intangible Cultural Heritage of Humanity in 2009, represented by the Pag, Hvar and Lepoglava lace. In the town of Pag, there is a small lace gallery, where you can admire a part of Croatian culture and some unique examples of lacework. Telašćica Nature Park occupies the southeastern part of Dugi Otok island. It is covered in a thick forest of pine, fig and olive trees, dotted with steep cliffs, coves, and islets. The total surface area of the Nature Park is 70.50 km2, with 25.95 km2 on Dugi Otok island and the neighboring islets, and 44.55 km2 at sea. The park is characterized by a Mediterranean vegetation, and it counts more than 400 plant species and also various species of sea life can be found along the coast of the park and the island, 300 animal and 250 plant species including the carnivorous sponge and red corals. Steep cliffs, also called “stene” (stone walls), rise to 200 meters above the sea level and descend to a depth of 85 meters. Telašćica gained the status of a protected area in 1980, then in 1988 was proclaimed nature park, thanks to it valuable flora and fauna, geological and geomorphological phenomena and impressive beauty. The bay was inhabited since the ancient times, as evidenced by the ruins of the Roman Villa Rustica from the 1st century. Telašćica bay is considered to be one of the largest and safest natural ports on the Adriatic and it is surrounded by 13 islands and islets, and 6 of them are located in the bay itself. Maybe the most interesting islet is Taljurić, which resembles a flat board with a diameter of only 60 meters. There is an amazing salt lake, called Mir (Peace) with curative mud, located at 146 meters above the sea level. Its salinity is above average and it is much warmer than the surrounding sea water. The Mir lake is also a habitat of the endemic species of eel called “Bižat” or “Kajman”. In the park, you can take many organized tours like diving, cycling, climbing, safari or fishing tour. Croatia is one of the most wanted nautical destinations and Telšćica Bay is a true paradise for sailors. Other than visiting this amazing Nature Park, Kornati National Park is less than a mile away and it is absolutely worth visiting, sailing around its many fascinating islands. Read more about the Telašćica Nature Park on their official web page. Years ago Croatia presented itself on the international tourism market with a slogan “Small country for a great holiday” as it perfectly describes what one can expect when coming to Croatia – a fantastic holiday in the country famous for its unspoilt nature, stunning coastline, more than 1200 island surrounded by the crystal clear sea, rich cultural and historical heritage and a long tradition in the tourism industry. Croatia has a total of 8 UNESCO World Heritage Sites and they are all well worth visiting – the old city of Dubrovnik, Plitvice National Park, Stari Grad plain, The Cathedral of St James in Šibenik, historic city of Trogir, Stećci Medieval tombstones graveyard, Episcopal complex of the Euphrasian Basilica in the Historic Center of Poreč and the historical complex of Split with the Palace of Diocletian. Other than these 8 stunning sites, Croatia has a great number of UNESCO intangible goods, the highest number of any European country like the lacemaking, gingerbread craft, knight’s tournament Sinjska Alka, Klapa singing and many other.The Croatian government has submitted 17 other astonishing sites which have been added to the Tentative List as being considered suitable for inclusion on the World Heritage Sites List. The Croatian government has submitted 17 other astonishing sites which have been added to the Tentative List as being considered suitable for inclusion on the World Heritage Sites List. Motovun is situated on Motovun hill and built over on a site of ancient settlement Castellieri. Motovun was mentioned in written records for the first time in the early 9th century, but it was fortified as we know it today by the Venetians, who took over Motovun in the 13th century and it made part of Venetian colonies for more than 500 years. During that period city walls, towers, and gates were built and remained almost completely intact till this day. Motovun is truly an exceptional place to immerse yourself in the past and discover what an amazing heritage our ancestors left us to take care of, and enjoy its beauty. Lubenice is an ancient fortified town situated on the island of Cres. The town was founded 4000 years ago on a hilltop and today it comprises forty buildings and has seven inhabitants. Velebit is the largest mountain range in Croatia. Its highest peak is Vaganski vrh at 1,757 m. The mountain is a part of the Dinaric Alps and it is located along the Adriatic coast separating Lika region from Dalmatia. Two of the eight Croatian National Parks are a part of the Velebit mountain, Paklenica and Northern Velebit National Park. North Velebit National Park covers 109 km2 of the northern section of the Velebit mountain, the largest mountain in Croatia. On the southern side of the mountain there is Paklenica National Park, so practically the whole of the Velebit mountain is a nature park. It is recognizable by its conserved biodiversity, the abundance of the natural phenomena and experience of pristine wilderness. Paklenica National Park is one of the eight national parks in Croatia. It is located near Starigrad in northern Dalmatia, at the southern slopes of Velebit mountain. The name Paklenica probably derives from black pine sap called “paklina”, which the locals used in traditional medicine, for wound treatment, for light and for coating of wooden boats. It was proclaimed protected area back in 1949 and as a national park in 1997. The most attractive parts are two canyons, Small and Big Paklenica. The area proposed for inscription on the World Heritage List is located in the center of the historic nucleus of the town of Zadar and comprises the Roman forum with the remains of a temple, the Episcopal complex, and the Archaeological Museum. Primošten’s vineyards also called the “stone lace” as they are well divided by long dry stone walls built centuries ago and are currently on the Tentative list of UNESCO World Heritage Sites. Vine has been grown in this area for centuries, planted almost in bare stone, precisely from the 8th century BC, when Illyrians populated the region. Kornati islands, also called Stomorski islands are located in northern part of Dalmatia, west of the city of Šibenik and east of the city of Zadar. Kornati islands occupy a sea area of around 320 square kilometers and are divided into two main groups – Upper and Lower Kornati. There are no permanent settlements on the islands and 89 of 140 islands were declared a national park in 1980. The area covered by the National Park principally coincides with the Upper Kornati, which includes the biggest island of the archipelago Kornat and the surrounding islets. It is a perfect place for numerous activities like sailing, snorkeling, diving, swimming, hiking, observing the plant and animal wildlife. The nature park, Telašćica, covered in a thick forest of pine and olive trees, occupies the southern part of Dugi Otok island. Telašćica gained the status of a protected area in 1980, then in 1988 was proclaimed nature park, thanks to it valuable flora and fauna, geological and geomorphological phenomena and impressive beauty. Also called Blaca Desert, a monastery built under a steep cliff back in 16th century. The monastery consists of a few interconnected houses, chapel, a small school and a commercial building. In the library, there are more than 11,000 titles printed in the monastery from 1895. Korčula is a small fortified town located on the northeast coast of the island of Korčula. The form of this charming historic town is determined by the form of small peninsula protruding into the sea and its connection with the island was cut off by an artificial channel. It is surrounded by the walls, built in gothic style, reinforced at the strategic points like those near the port, where major attacks were expected. The streets of the town are arranged in a herringbone pattern in order to reduce the effects of the sun and wind. The old town is the main attraction with its walls, towers, narrow streets and the wondrous architecture mainly influenced by Venetian Renaissance. Historical-town planning ensemble of Ston with Mali Ston, connecting walls, the Mali Ston Bay nature reserve, Stonsko Polje and the salt pans are on the list. the famous Ston walls, also known as the “European walls of Chine”, are a series of defensive walls built in the 14-th century, along with 40 towers and 5 fortresses. The walls surrounding the town are about 900 meters long, and the Great Wall of 5 km outside the town.The walls were built by the Republic of Ragusa, in order to protect its borders, but especially to protect the valuable salt pans that contributed to the Republic’s wealth. Tvrđa is Habsburg star fort built on the right bank of the river Drava, located in the immediate vicinity of medieval Osijek. It is the best-preserved and largest ensemble of Baroque buildings in Croatia and has been described by the World Monuments Fund as “a unique example of an eighteenth-century baroque military, administrative, and commercial urban center”. Veliki Tabor is a medieval castle located in the region of Zagorje. It was built back in the 15th century by a noble Hungarian family of Rattkay, who owned the castle for 300 years. Numerous exhibitions and presentations can be seen in the castle, which includes ethnographic items, armor, paintings, presentation of the Rattkay family who owned the castle for over three centuries. Lonjsko Polje is the largest protected wetland in both Croatia and the entire Danube basin. It covers an area of 505.6 square km, extending along the river Sava from the areas east of Sisak, the lower course of the river Lonja for which it is named, to the areas west of Nova Gradiška, along with the course of the river Veliki Strug. Varazdin’s gorgeous Castle is situated at the very center of the city. Other than admiring its beauty from the outside, you can enjoy the permanent exhibition inside the castle that includes numerous paintings, photographs, ceramics, books, historic documents, sculptures, furniture and much more. The city is full of breath-taking Baroque palaces, some of them being Town Hall, Draskobiv Palace, Jankovic Palace, Palace of Varazdin County, Pauline Mansion etc. Read more on the UNESCO World Heritage Site website. Primošten is a small town situated between Šibenik and Trogir in Dalmatia region. It offers a typical Mediterranean landscape with charming narrow streets, densely built traditional village houses, wooden boats and pristine beaches. Just as the town of Trogir, the old town of Primošten was settled on a small islet in order to ensure a better protection from enemy armies. During the Ottoman Empire invasion in the 16th century, the small islet was protected by the walls, fortified towers, and gates. Later the bridge was removed and replaced by an embankment, so the town of Primosten became a peninsula. Historical sites you should visit when in Primošten are the parish church St Juraj built in 1485 on a small hill just in the middle of the old town, the church of St Roko built in 1680 and the Curch of Our Lady of Grace built in 1553. The town’s medieval core is beautiful for a walk around, relax by the sea or enjoy the tastes of the region with the view. Another impressive thing to see are the famous Primošten’s vineyards, also called the “stone lace” as they are well divided by long dry stone walls built centuries ago and are currently on the Tentative list of UNESCO World Heritage Sites. Vine has been grown in this area for centuries, planted almost in bare stone, precisely from the 8th century BC, when Illyrians populated the region. A photo of these stunning vineyards can be seen in the UN headquarters in New York. Don’t miss to taste the native Croatian red wine grape “Babić”, typically grown in this region. Near the vineyards, there is one of the most protected and well-equipped marinas on the Adriatic, Marina Kremik, located in a spectacular bay. Primošten has beautiful long, pebble beaches, located right in the center of the town, bathed by a crystal clear sea and almost entirely surrounded by lovely pine trees, that make a perfect hideout from the midday sun. One of the most beautiful beaches is Raduča beach, located in Vela Raduča bay and it stretches along the entire length of the homonymous peninsula. The beach can often be found on the list of the best beaches in Croatia. Another beautiful beach is Mala Raduča (Small Raduča), that lies in Mala Raduča bay, located practically in the center of the town. Raduča beach stretches along the entire length of the Raduča peninsula. During the summer the beach is a bit crowded, so if you are in search of relaxation and tranquility there are numerous hidden beaches along the coast towards Šibenik or Trogir. Just as other coastline towns, in Primošten you can enjoy in many activities, practice water sports like snorkeling, scuba diving, stand up paddling or play mildly strenuous games like table tennis or mini golf during the warm summer afternoons. Thanks to the epic TV series, Game of Thrones and its impressive popularity, Dubrovnik and Split received a record number of tourists in the last two years. Most of the filming locations in Croatia were located in Dubrovnik, among the fans of the series better known as the King’s Landing, the capital of Westeros. Dubrovnik is one of the most spectacular places in Croatia, a town that already itself looks like a great filming set. Many other famous movies and TV series were filmed in Dubrovnik, and just last month the town turned into a huge filming set for the new Robin Hood movie with Jamie Foxx as Little John and Taron Egerton as Robin Hood, to be released in 2018.